YOUNGSTOWN, Ohio — After more than a century of serving the needs of women in their respective cities, the YWCAs of Youngstown and Warren merged in May to form the YWCA Mahoning Valley – and that combination is already having a big impact. Pending a formal application process, the newly reminted organization is in line for a $25,000 grant from the Coca-Cola Co. to support women’s entrepreneurship. It’s a grant that the YWCA of Youngstown had applied for in the past but was denied, says Leah Merritt, president and CEO of YWCA Mahoning Valley. Now, on the strength of both branches operating as one, it can better compete for those types of grants, she says. It’s the start of what Merritt hopes to be a stronger presence in both communities. As competition among nonprofits for funding dollars intensifies, the merger made sense, and the organization is being noticed more and more, she says. 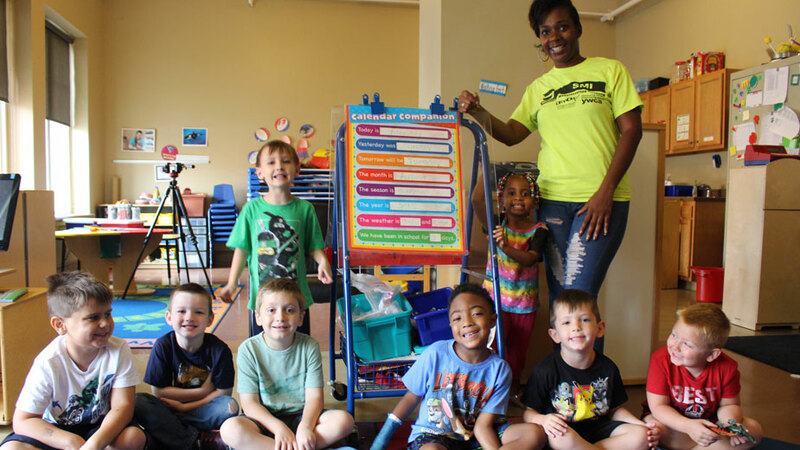 Keona Christian leads her preschool class at YWCA Mahoning Valley’s Youngstown branch. Students (front, from left) Damian, Landon, Vasco, Luis, Luca, Frank, (back) Greg and Dreaunna were part of this year’s graduating class. The YWCA celebrated the graduation of 10 students during a ceremony Aug. 17. Year-round preschool is available for students ages 3 to 5. The merger wasn’t taken lightly. For a year and a half, confidential talks between the two organizations, their boards and partners considered the financial, legal and logistical elements of a merger, she says. Since it was made official May 1, the staff and executive committee, made up of members from both boards, has been putting together a strategic plan to determine exactly how the YWCA Mahoning Valley will look moving forward. Kenya Roberts-Howard, the former executive director of YWCA Warren, is working part-time through the end of the year to iron out the details of how the Warren organization operates before moving on to start her own business, Merritt says. The YWCA receives funding from the United Way of Youngstown and the Mahoning Valley, as well as the United Way of Trumbull County. While the costs of occupancy and utilities will stay the same, Merritt expects to see savings through consolidation, such as bookkeeping, administrative overhead and maintenance. Part of the planning process is evaluating all of the existing programs and services, she adds. By streamlining the two branches’ programs, executives look to expand services to meet increased community needs, says the YWCA’s chief operating officer, Varada Bhide. For example, she explains, the merger creates a larger pool of resources to pull from for housing and supportive services and can potentially increase permanent supportive housing where it’s needed. The YWCA has 89 housing units for low-income and homeless populations, including 12 in Warren and the new five-unit mixed housing Kensington Liberation Station on Youngstown’s north side, which opened in 2017. Last year, the YWCA Youngstown provided housing to 275 women, some as young as 18, and their children, Bhide says. Many of the women are referrals from organizations such as the Youngstown Metropolitan Housing Authority, which helps subsidize housing programs, she says. During the average eight-month stay, the YWCA helps each tenant get back on her feet with soft skills training, such as writing a resume or interviewing for a job. The training fulfills the YWCA’s empowerment component, which gives women tools to find and apply for employment, she says. Funded by a Community Development Block Grant from the city of Youngstown, training is offered in partnership with the Public Library of Youngstown and Mahoning County as well as Apprisen in Boardman for financial education that “teaches them how to build assets once they start earning that income,” she says. Other financial assistance programs are available to the public. In 2017, the YWCA partnered with the Mahoning Valley Economic Opportunity Coalition to provide income tax preparation assistance through the Volunteer Income Tax Assistance Program, or VITA. The organization filed taxes for 350 people with a total household income of $60,000 individually, $90,000 if married, and brought back nearly $300,000 in returns, Bhide says. The YWCA offers classes on how to file taxes as well. Additionally, the merger opens programs that benefit young girls to a larger population. Such programs include the Youngstown branch’s Young Women with Bright Futures and the Warren branch’s Girls’ Camp and Girls Leadership programs. 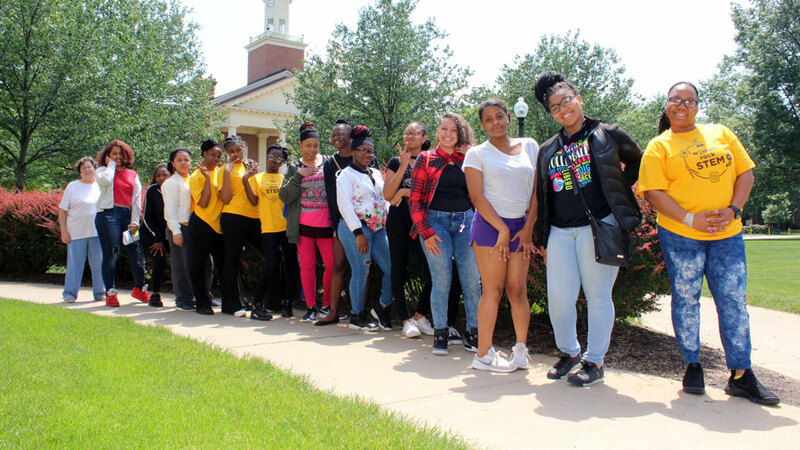 Participants in Girls’ Camp 2018 visited Baldwin Wallace University in Berea to learn lab techniques and get hands-on experience in several STEM disciplines. Girls’ Camp is funded by the United Way of Trumbull County, the Community Foundation of the Mahoning Valley and the Beecher Foundation. This year, Bright Futures recognized 31 high school girls at its annual banquet and provided them with leadership development sessions that included communication, strength-building, racial justice education and a community service project. It awarded two girls $12,000 and $8,000 scholarships, respectively, funded by a $20,000 annual donation from the Thomases Family Endowment of the Youngstown Area Jewish Federation. “We want to educate the girls. We want to provide them the tools to succeed in their career and education; they’re the future leaders,” Bhide says. Some 20 middle school and high school girls attended this year’s Girls’ Camp, where they were exposed to science, technology, engineering and mathematics, or STEM, education, as well as life skills and career readiness. The camps are supported by the United Way of Trumbull County and the Arconic Foundation. In the last few years, the YWCA’s focus on STEM education has included its preschool students, Bhide says. A partnership with the library and Oh Wow! The Roger & Gloria Jones Children’s Center for Science & Technology provided summer STEM manufacturing camps for the students. 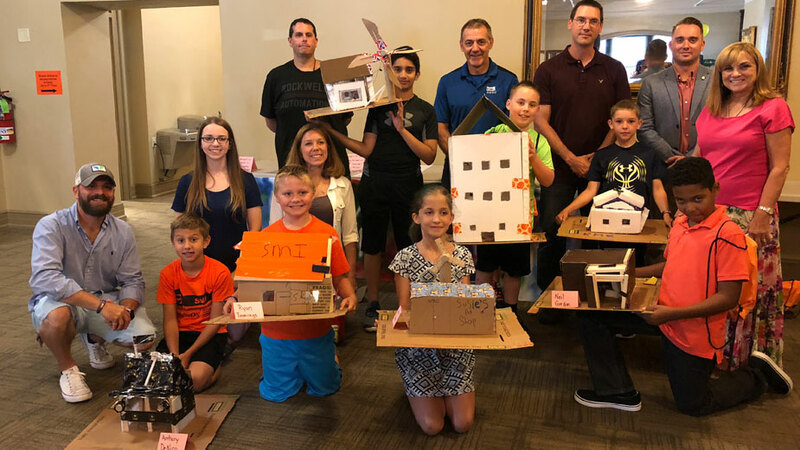 STEM-focused summer camp held in partnership with Oh Wow! The Roger & Gloria Jones Children’s Center for Science & Technology. It’s something Bhide witnessed with her own son, Arnav, 11, who has taken part in the manufacturing camps since the first grade, she says. The merger gives the YWCA Mahoning Valley a stronger voice when pursuing funding for its programming like STEM education, says its public relations and advocacy manager, Molly Toth. Through advocacy work, the YWCA promotes the investment of resources in the most marginalized populations to effect change in the overall community, she says. That includes advocating for policies that promote women’s economic empowerment or promote racial justice. Most recently, as part of the Ohio Council of YWCAs, regional branches joined others to meet with representatives from the offices of U.S. Rep. Tim Ryan, D-13 Ohio and Sen. Rob Portman, R-Ohio, to push for policies to eliminate racial profiling in police departments, as well as those that provide for sick days and paid leave for families, Toth says. While such advocacy work can be “an uphill battle,” she says, the YWCA has seen its share of victories. In 2015, the YWCAs of Warren and Youngstown partnered with other state branches to turn back an effort in the state budget to cut the Ohio Housing Trust Fund, which organizations rely on to assist people facing homelessness or are at risk of homelessness, she says. Locally, the YWCA is working to increase community awareness of its offerings. Last year, the Youngstown branch provided advocacy training sessions to 350 people, such as how to engage with elected officials and decision makers. The trainings earned the branch a nomination for a YWCA Excellence in Advocacy award from YWCA USA. Bystander intervention trainings educate people on how to intervene when they see someone being targeted. Toth has conducted trainings with YSU student athletes and organizations as far as Summit County, and encourages those who work with the public or in education to take them. “It’s a great training for kids who are in high school and middle school. It’s great for teachers,” she says. Barbara Brothers admits she didn’t know much about the YWCA Mahoning Valley before she got involved in the 2009 capital campaign that helped fund the preservation and renovation of the building at 25 W. Rayen Ave. After volunteering on the campaign, she says she was impressed with the organization’s work and got more involved. Since then, she has served as volunteer, donor and board member, and has supported several of the YWCA’s programs, specifically the YWCA Women Artists: A Celebration! event. The art show, held in June, was open to girls between the ages of 14 and 17 for the first time in its 36-year history. While Brothers was involved in the planning of the event as a board member, she played an equally significant role as a donor this year. The retired dean of what was the College of Arts and Sciences at Youngstown State University, Brothers had amassed a collection of work from local artists. She donated eight works from local women, including Mary Kay D’Isa, Tazim Jaffer, Susan Russo, Maryann Limmer and Sara Strauss. All of the works were displayed and two were auctioned. Proceeds from the show support the YWCA’s transitional housing program. The other works will remain in the organization’s permanent collection. Support for programs such as the art show is important because they benefit community residents “who need the help the most,” Brothers says. By working with a cross-section of ages and demographics, the YWCA helps “women and children who really need somebody to be a voice and advocate,” regardless of race or age, she says. “It’s an opportunity to work together, and really bear witness to how, when you come together from the different races, we are really one working to help solve problems in our community,” she says. Brothers started teaching at YSU in the 1960s and became chairman of the English department in 1974. 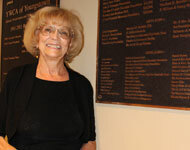 She served as dean until her retirement in 2001. A lifelong resident of the Mahoning Valley, Brothers says she has watched the once prosperous community become “not so prosperous.” But working alongside the leadership and the staff of the YWCA makes her hopeful. And with the YWCAs in Youngstown and Warren merging this year into the YWCA Mahoning Valley, Brothers is looking forward to the work the unified organization will do. It is “well worth the effort,” for the two cities to work together, she says. Picture above: Varada Bhide, Molly Toth and Leah Merritt say the merger helps YWCA Mahoning Valley broaden its efforts. Community members can make a positive impact on the YWCA Mahoning Valley through monetary donations or by volunteering their time. Because of the merger, the YWCA’s website will be undergoing a change. For now, donors can go to YWCA.org/Youngstown to make a donation online, or by check payable to YWCA and mailed to 25 W. Rayen Ave., Youngstown, OH 44513. Donors can call the YWCA at 330 746 6361 or visit the YWCA’s Facebook page at Facebook.com/YWCAMahoningValley. Donations of $100 or more can be made online through the Youngstown Foundation at YoungstownFoundation.org, which will increase the amount by 5%. Select YWCA Mahoning Valley and enter the amount. Although volunteer opportunities aren’t always available, the President and CEO Leah Merritt encourages interested parties to contact the YWCA and let staff know how they would like to help, she says, whether full or part time.